A phtograph of Una Faithfull's child. Mrs. Faithfull is still debating what to name he/she/it. KALAMAZOO, NEW JERSEY, U.S.A. -- After 12 hours of excruciating labor, Kalamazoo resident Una Faithfull finally ejected the annoying lump in her abdomen. However, what was supposed to be a joyous occasion quickly turned sour. Says Una, "I first realized something was wrong when my husband, Ron P.Rick, shouted, 'What the fork?! This is a blasted WEASEL!!!' Then I began to get worried." The neighborhood was ablaze with gossip when Una and the small mammal returned from the hospital. One neighbor of Mrs. Faithfull's, a Ms. Bertha Blab, confided in an exclusive interview, "It was the mailman who did it." Accusations raged about infidelity. Una was ostracized, and Ron committed suicide, embarrassed beyond anything therapy could salvage. 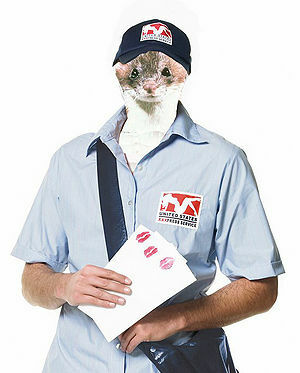 The mailman in question, Mr. 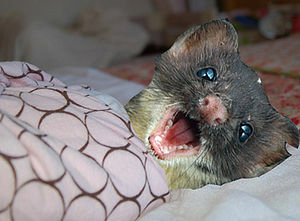 Fuzzy McWhiskers, after shown the child and asked if it was his, answered candidly, "Squeek squeek squeekity squeekem." However, without Mr. Rick alive, there is no sure way to know whose weasel it belongs to, as paternity tests for the dead are often faulty. As for now, the baby will have to live without a father figure. Or a weasel figure. Could this man be the father of a weasel? The world may never know. This page was last edited on 5 June 2012, at 09:12.